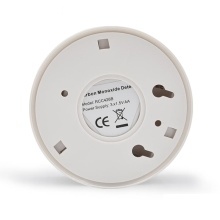 This is a perfect item for protecting your family from the dangers of carbon monoxide. Advanced level of protection, easy to read with the digital display, even in low light conditions. Advanced level of protection, easy to read with the digital display, even in low light conditions. Displays the level of carbon monoxide the unit is sensing. Compact, lightweight and easy to operate. Long life, pinpoint electrochemical sensor. This alarm is highly recommended to be mounted on a wall surface. Red LED: When a dangerous level of carbon monoxide is detected the red LED will pulse and a loud alarm pattern will sound. The carbon monoxide alarm pattern is 4 short beeps, followed by 5 seconds of silence, followed by 4 short beeps with a corresponding red LED flash. This cycle will continue for 4 minutes and then change to 1 cycle every minute until the device is reset or the CO is eliminated. Test/Reset button is designed for weekly testing if it works properly and reset the unit during CO alarm.